Whenever I hear anyone talk about ways to make your smartphone work for you, I think, That's great, but I don't have a smartphone. 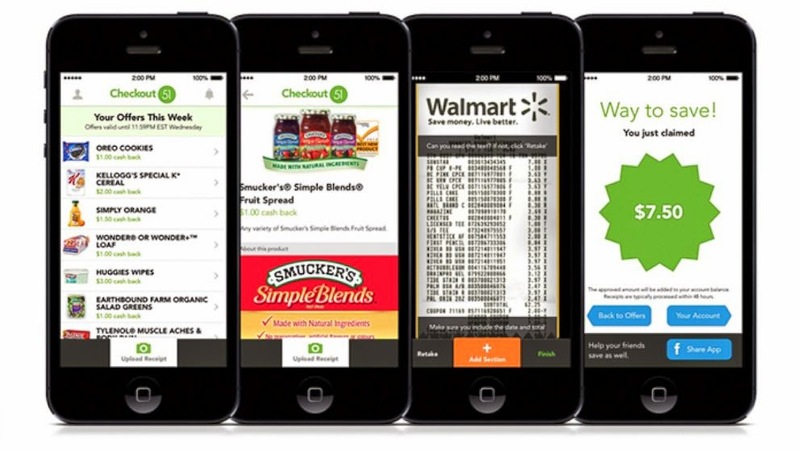 Thankfully, you don't always necessarily need a smartphone to cash in on some of the fantastic apps out there where you can earn money or get rebates on groceries. Depending on the device you have, you can get these apps - no smartphone needed. Currently, the apps I use are loaded on my family's iPod Touch. I shared here how I scrimped and saved to buy the iPod. At the time, I bought it mostly to listen to music at work, but I don't work at that particular job anymore. For a long time, it was gathering dust, and I considered selling it. Then, Jason started using it for games and I started playing in the app store. I was super excited when I found I could get certain apps I'd had my eye on! There are two apps that I highly recommend you see if you can get on whatever electronic device you have. Most people do have smartphones, so if you do, please run (don't walk) to your phone and get these apps STAT. If you don't have a smartphone but have some other device, it's definitely worth taking a look to see if you can get either of these two specific apps. What if you don't have any device to get any apps? Well, you'll have to make a choice as to whether or not you should get one, but I will say that I think it's well worth it to have a device that you can use for pleasure and business - in this case, making money. This is my favorite money-making app. Each week, there are offers you can redeem. It doesn't matter which store you shop at. You can shop anywhere, and if you buy any of the offers listed, just upload your receipt and you'll get a rebate. For instance, I bought 5 loaves of bread from my local bread thrift store. My total was $2. An offer was up for 25 cents for any loaf of bread. I uploaded my receipt within the app (dirt simple to do, you don't need a printer/scanner/copier, just your device), and it was processed very quickly. 25 cents was put in my account. Once I reach $20, Checkout 51 will send a check to me. You can check out this app here. Other people have had fantastic luck with this app, and while I've managed to redeem a few offers, it's not as easy to use as Checkout 51. You have to select which store you shopped at, and I'll tell you this: bread thrift stores aren't listed. Most major grocery stores are, however, including Meijer, so that's one bonus for them. Once you select the store you shopped at, you can see the offers available for that particular store. Offers can vary store to store, but usually most of them are the same. Each store will have some exclusive offers - I've never cashed in on any of those. You upload your receipt in the same exact way you upload receipts for Checkout 51, and once you reach $2, you can get a gift card, or you can opt to transfer earnings to PayPal or Venmo when you reach $5. You can check out this app here. There are a lot of great apps out there. I've heard others have used Shopmium and Shopkick. I downloaded Shopkick, but haven't been motivated to use it since I don't often take the iPod out of the house. I haven't had a chance yet to look at Shopmium. What great apps do you use to make money? Please share in the comments!